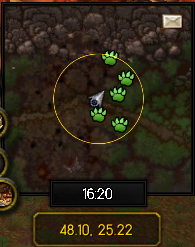 Found a paw at 46,33 and catch one when I useGeneratore di Tunnel Spaziotemporali: Nordania to reach Sholazar Basin. These guys seem to respawn every ten minutes or so, regardless of whether you kill other things in The Savage Thicket or not. I spent 90 minutes killing Uovo di Draco Primordiale, Prole Primordiale, and Draco Primordiale in the area and 5 total Proto-Draghetto di Smeraldos (1 Rare, 1 Uncommon, 2 Common, and 1 Poor) spawned, with the Rare spawning 90 minutes after I first entered The Savage Thicket and began slaughtering mobs. I then waited 40 minutes without killing any mobs in the area and found that 2 Uncommon and 1 Common Proto-Draghetto di Smeraldo had spawned. However, to pass the time between spawns, you may want to slaughter Draco Primordiale for their Carne Nordica, and Skinners can get Cuoio Boreale and Scaglie di Drago del Gelo from them as well. Anyone notice that this pet doesn't count towards the achievement Safari di Nordania? Maybe it's just too good for it, considering the achievement requires that you catch all of Northrend's battle pets, but the whelp isn't on the list. Draghetto della Piaga is extremely good to counter Emerald Proto-Whelp. Start with Call Darkness which mostly take 50-100% his life and follow with Shadowflame/Plagued Blood. Proto-Draghetto di Smeraldo is one of three Battle Pets that can be caught in Northrend and are NOT a requirement for the achievement Safari di Nordania. If you're trying to catch this for the new Wailing Caverns pet dungeon, instead of waiting for these to spawn you can simply join Rift of Aln in LFR Emerald Nightmare and catch Draghetto del Sogno instead: has the same 3 core abilities but is a guaranteed spawn after you kill the boss. Questo PNG si può incontrare qui: Bacino di Sholazar (43). Questi drachi meravigliosi si trovano lungo le spiagge di Nordania.